"I stood there for a while and saw the near and the far. The sea towards the west, the distant mountains in the east, the fields and the people passing by the road below"
After coming from the Watchtower at barangay Torre in Currimao, i rode a mini-bus that arrived at Laoag City at 3:12 in the afternoon. Although i've been to Laoag City many times before, i cannot remember much of where were the terminals of the jeeps going to a specific place. I rode a tricycle to get me to the terminal of the jeeps going to Bacarra. There, i rode a jeep that arrived at Bacarra town proper at 3:28 in the afternoon. It was there were i got a tricycle ride going to the barangay of Natba. At barangay Natba, the watchtower can be seen on top of a sandy mound . Stayed there for some time enjoying the mellow late afternoon sun that gives a yellowish tinge to everything it shines on and the cool sea breeze. I also did a sketch of the ruins and got some photos and videos of the subject. It was about some few minutes before 5 o'clock in the late afternoon that i got a tricycle ride going back to downtown Bacarra and eventually rode a jeep going back to Laoag City. 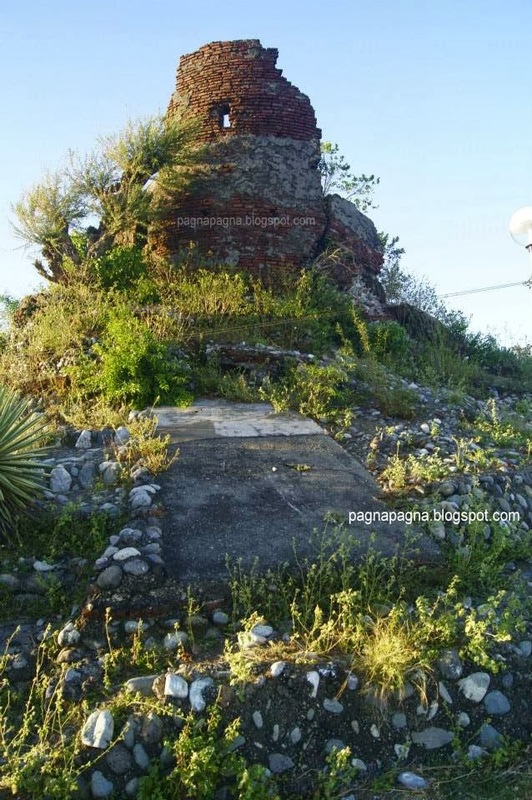 Located on top of a mound at the barangay of Natba, this watchtower is generally made of bricks and is now what we refer to as "ruins". Though a small portion of its wall still stands mercifully, all others had crumbled and scattered on the ground. There were signs that the area of the watchtower had been developed before. Some planters and concreted short portions on a side of the watchtower are there but are slowly being destroyed through passage of time. Standing on the mound where the watchtower is also located, one can see the outlying fields, mountains and seas, to name a few. It is the highest place in the area. From Manila, ride a bus bound for Laoag City. 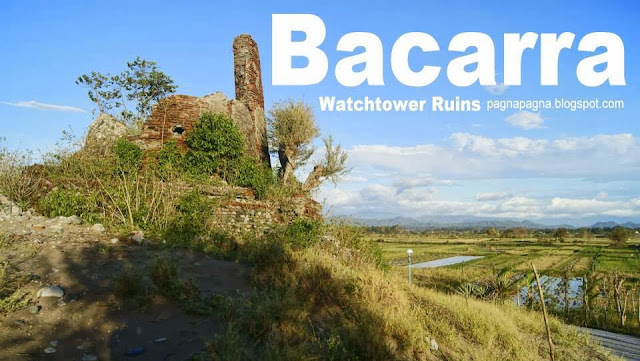 At Laoag City, ride a jeep bound for Bacarra or bound for Pasuquin. The terminal of jeeps bound for Bacarra is located near Llanes Street corner Lazaro Street, some 1 or 2 more intersections at the back of the Provincial Capitol (better ride a tricycle to the jeep terminal). At Bacarra, ride a tricycle to barangay Natba. Tell the driver to get you down at the intersection along the National Highway going to barangay Natba of Bacarra. And at the intersection ride a tricycle going inside to the seaside barangay of Natba.